When we go through life with awareness and openness we can become more of who we are meant to be and have the impact each of us are uniquely here to make. All too often, we don’t realize our own potential or how powerful each of us can be. We let our own self-limiting beliefs get in the way and the inner bully runs the show. Many lack confidence or courage because of a lifetime of conditioning that feels real and true but can be overcome. I am here to help you see your potential and step into it powerfully with ease and joy. 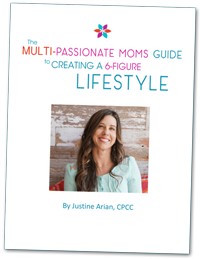 Download the Multi-Passionate Moms Guide to Creating a 6-Figure Lifestyle and you will have taken your first step toward embodying your new realty.